A Message from Lance in the UK! am all over the UK over the next week. Sunday afternoon, I am at the event. I teach the coolest Lucky Box ever. On Monday I am going to Scrap Geanie. I am teaching a Teach the teachers class. It is a fun class. I teach a couple of projects and while I teach I tell them what I am doing to help teachers learn more about teaching. Did I say teaching enough? Tuesday I am with Altered Treasures. I think that is what this post is about. Wednesday, I am at the Scrap Book Shop up north. Thursday is in Edinburgh with one of Rusty Pickles amazing designers Becky. Then after a quick Air Lingus flight I am off to Dublin Ireland for a great little mini event with the Scrap Book Store by Annamarie. I get to teach with Donna Downey. She is AWESOME. We had a blast this week on a bit of a whirlwind tour. Monday was Scrapbook Mate in Holland. Tuesday - early, off to France by way of Geneva. Wednesday in Belgium. Voulez vous scrapbook avec moi ce soir? I had some great fries in Belgium - oops I mean chips. Then back to northern Holland for Simpel Scrappen. Then, Donna was off to the UK and I was left here teaching until tomorrow night. It is a good thing that I can sleep on flights. Helen mentioned there was a question about if I had taught these classes already or if they are old. As for teaching old classes. Some are and some aren't. For Altered Treasures, Girl Unexpected is but Pocket Pop Up is about 8 months out. But these two are my favorite of all the classes that I have taught in the past 4 years. Besides, if you didn't take take it with me then it is now - new to you. They are also the most technical and maybe the most difficult to teach but they are the best classes that I have taught and I have figured out how to teach them to people of EVERY level (and all in the same class). I break them down so that beginners can get through the class as well as an advanced scrapper. These were designed by Karen Burniston. Karen is one of my favorite designers for my classes. Every kit that she does for me - moves, flips, pops or is just way too freaking cool. The girl unexpected I believe that I taught it in Whales last year. And as for the pop up, I taught it in Holland last December (sort of). I didn't have the actual kits and so I had to fake it. I ended up teaching the pop up part of the kit and then we put it into another kit that they received during class. They were then sent the kit a few weeks later. Here are some revisions to my supply list. POP UP kit - Do not to worry about the needle nose pliers. I have changed how I teach this class - don't bring them. You should bring a Tacky tape (glue dots don't really cut it -If this is a problem email Helen or me at lance@rustypickle.com A scoring tool is Critical (But I also have a bunch of these). Finally, I also recommend a wet adhesive OR glue stick for both projects. I get on a plane tomorrow for the UK and am a little anxious about renting a car and driving on the "wrong" side of the road again. Cheers. PS: if you see me just give me a "BRILLIANT". I love that word, but only with an English accent. Check out Donna Downey's blog for a peek at Lance in Japan (he's featured about halfway through the video)! More peeks to come from the trip so stay tuned! East Coasters, are you lookin' for a break from the Winter cold?! Lance will be on the East Coast throughout the weekend and into next week! He will be teaching at several stores in the area so here's your chance to take a class from the Pickle Man himself! See store links for details on their websites. Jennifer Halleck was kind enough to send in these photos from Lance's recent trip to Colorado. Did you get the chance to take a class from Lance recently? We'd love to see your photos! Email them to us and you may see them right here on Lance's blog! Guess Who'll Be In Colorado This Weekend? Our favorite Picklelicious guy, Lance, will be teaching throughout the coming weekend and into next week all over town! See below to find a location near you to get in on the fun! 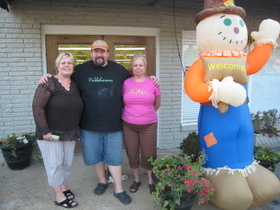 So I went to teach at Scrappuccino this past Monday and it was this Amazing Fun Southern Store. You are driving down this country road and all of a sudden there it is- about a half hour out of Nashville. When you walk in it is this OLD building with ALL the charm you would expect from a southern store. I taught both the Inner Circle and the Window-Pane classes. Both went well even though we were missing the letters for my Window-Pane Class. As you can see, I wore my typical black t-shirt and this was a good thing. 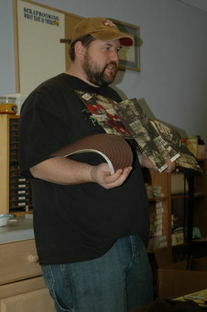 In the Inner Circle Class, I was helping with an album and tried to put some of the 3M glue on a page. I couldn’t get any glue out so I squeezed really hard and then BOOOM it EXPLODED. All over me and the wall and just a little on the floor. OOPS. Good thing I had my nice old black t-shirt on. The big news of my trip however, was the dinner we had in-between the two classes. We walked next door and had the best southern cooked meal ever. 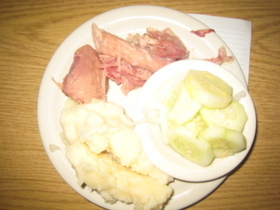 I had the ham with mashed potatoes and fresh cucumbers in vinegar (I had to have seconds on the cucumbers). As for desert, WOW. It was a fresh raspberry cobbler warm with vanilla Ice Cream. The whole thing was less than $10, tip included. If you are ever there, you must try it. 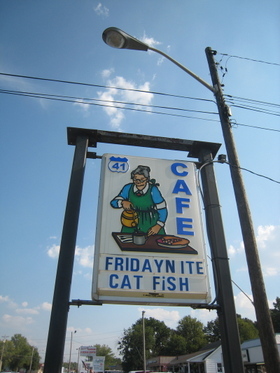 The sign said “Cat fish – Friday night”. What an idea – cat-fish and cropping on a wailing of a good time, Friday night. I have to thank you both for the great time and even better food.